Upstairs at the Lawrence Batley Theatre, Huddersfield, sits a small, intimate performance space called The Attic. With around 40 people taking their seats, it’s a perfect setting for a close up, personal show such as Baabul. A show penned as “a daughter’s appreciation and gratitude to a father who raised his daughters as a ‘blessing’”. 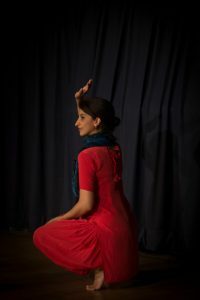 Sameena Hussain waits in the corner to begin her performance. There’s only her, a dark curtain and a projector screen. And as she walks to the centre of the floor, she sits down and we watch a slide show together. Candid photos and selfies of her and her father, to the beautiful Madhania by Neha Bhasin. We’re looking at images that clearly show love, adoration, smiles and laughter between the two of them. It sets the scene perfectly for the autobiographical 45 minutes that Miss Hussain is about to give to us. Behind Miss Hussain there is no set. The focus is on her. Her words, her elegance; and grace in movement and delivery. It re-enforces a beautiful story that she’s telling, with words, gesture and in song. We learn about her life with a wise man, who has a knack of instilling a belief in his daughter that she can be whoever she wants. Whether times are good, or times are trying. It’s a performance of emotion. At times tears are in Sameena’s eyes (along with a few tears in the audience) as important life issues are raised. But how her father deals with these issues brings the room back from any deeper moments in the story. Sameena also offers clever injections of humour which not only brings about laughter, it reminds us that her story is one of warmth and happiness. Her pleasure at performing a story that is important for her to share is clear. And it’s infectious. Sameena pays homage to a person barely any of us knew at the start of the performance, but all know a little bit better by the end. Glad we are about it, too. Baabul has been nearly ten years in the making. Either in Sameena’s mind, her notebook or in the rehearsal room. She tells us that it’s still a work-in-progress, but if she hadn’t said that you’d never know. One disappointment? Only that it had to come to and end. I and most if not all the audience were immersed in the story, and we could have happily stayed seated, to watch and learn even more. In the Q&A session at the end of the performance, the audience appreciation was perfectly clear. One comment in particular suggested that Baabul is worthy of a bigger platform, and nobody could disagree. And many found themselves relating to one part of the story or another. Who’d have thought that someone telling you about how great their relationship with their dad could be so profound? Well, in Baabul it is. And it’s much more than that. It’s a message about life, with wise words from someone who is most definitely a lovely, decent, and inspirational man. Baabul will be performed by Sameena Hussain time and again. She tells the tale well, her movement needs to be seen, and she sings beautifully too. If you’re lucky enough to see it yourself, you’ll be better for the experience.